The multipurpose controller “Katron-SKZ” is intended for a powerful thyristor or Inverter DC power supply control. For example, power thyristor module of cathodic protection rectifiers, monitoring and maintenance of technological parameters like “Output current”, “Output voltage”. When connected a permanent reference electrode (Copper-Copper Sulphate) to a controller, the adjust of the output source DC parameters can be carried out relatively the protective potential voltage. To complementary definition of the corrosion protection effectiveness can connect up to four individual corrosion indicators of various diameters to the controller’s inputs. The controller generates alerts in cases on or off mains power or unauthorized cabinets opening. The alarm signal transmitted control office or staffs cellphones through the SMS-massages. The controllers battery life from the external battery in the learning mode on the GSM modem is at least 10 hours. It depends of the installed batteries capacity , of the polling frequency and of the base GSM stations signal quality. The controller has been collecting, archiving key parameters and information transmission on corrosion processes and corrosion protection of underground metal constructions through technical communication channels into the remote control system via Modbus RTU. Collection, further processing and presentation in the convenient for analysis form , performed in hard-&-software complex “DON-STEL-K”. 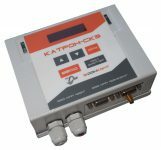 One of the applications of the universal controller “Katron-SKZ” – gas extraction, transportation and storage of natural gas and oil, pipelines, compressor stations, underground gas storage facilities, and others. The management and scheduling building based on “Katron-SKZ” possible using wire line – using the built-in interfaces, CAN, RS-485 or optional RS-232, Ethernet, and with the help of wireless – using GSM / GPRS-modem or radio. modules on any of the built-in interfaces. performance of the microcontroller 100 MIPS. The volume of non-volatile memory for storing backups – Flash memory of 131,072 (128K) bytes. the ability to work on any non-standard protocol through any of the ports. It allows to connect devices with a non-standard protocol.